Young George was a rabbit. Not just any rabbit you understand. George was a rainbow rabbit. His fur was composed of the most beautiful colors of the rainbow, and George truly loved to display his beauty. George the rainbow rabbit lived in a burrow on the lane under a rather large oak tree, along with his rather large family. George had three brothers and four sisters, each of whose fur was a combination of the most beautiful blacks, browns and whites, but none of them could top the beauty of their brother George, the rainbow rabbit. Unfortunately, George knew exactly how attractive he was, and he flaunted his beauty whenever possible, and often, in the most annoying ways. George's friends were considerably less beautiful than he was, or so George thought, anyway. George often wandered up and down the Lane so that his friends, who he felt were not as beautiful, could see him, and compliment him on his beauty. One day as he strolled the lane, William, a very handsome gopher whose fur was comprised of the prettiest shades of brown, popped out of his hole and noticed his friend George with the beautiful rainbow colored fur. William was a good natured gopher, and he kindly complemented George on his beauty. My goodness George, your fur certainly looks quite beautiful today, smiled William. Oh I know ! And I'm sorry you cannot be as beautiful as I, said George. That actually made William feel rather badly, because William felt that he was beautiful too. I may not be as beautiful as George, William thought, but I think I'm beautiful in my own way. George continued down the lane without a care in the world, because after all, he was beautiful. Martin, a sociable and good looking crow whose feathers were comprised of the most beautiful shades of black, also noticed George and his beauty. Martin, who sat atop an old tree stump, decided that on this, the most beautiful of days, he would compliment George, whose fur was comprised of the most beautiful colors of the rainbow. Good golly George, you sure look beautiful today! crowed Martin. Oh yes, I am the most beautiful creature on earth, and I am so sorry that you cannot be as beautiful as I, but I cannot help that. Martin quickly became unhappy, on this the most beautiful of days. Well, I always thought that I was beautiful in my own way said Martin to himself, as he flew off in bewilderment. Continuing on, George began to think himself even more beautiful because after all, so many others also noticed his beauty. Nancy hopped into the lane. She was a lovely little Tree Frog comprised of the most beautiful shades of green, and she too noticed George and his beautiful colors. Goodness George, don't you look beautiful today! croaked Nancy. Well of course I am, acknowledged George. Everyone can see how beautiful I am, and I'm sorry that you cannot be as beautiful as I, but I cannot help that. George's response left Nancy feeling rather low, and as she hopped away she thought to herself, I may not be quite as beautiful as George, but I'm special too, aren't I? At the end of the lane was a playground where the youngsters of the forest gathered to play. On this the most beautiful of days, William Gopher, Martin Crow and Nancy TreeFrog entered the playground feeling about as low as they possibly could. What's wrong with you two? asked Martin Crow. Well, to tell you the truth, I don't feel very good about myself today, croaked Nancy. And I don't feel very good about myself either, sighed William. Something George said to me earlier today made me feel pretty miserable. That's what happened to me too, William said. Then he thought for a moment. 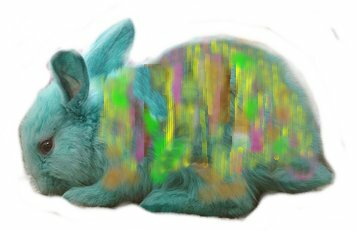 Perhaps from now on we should just ignore George the not so beautiful rainbow rabbit, he suggested. 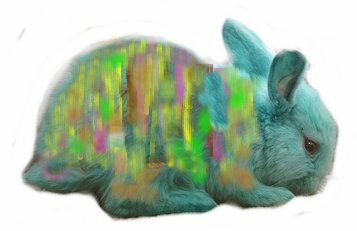 So on that day it was agreed, there would be no more niceness to George the not so beautiful rainbow rabbit. The next day, George was feeling exceptionally beautiful, and he went for a hop down the lane so that others might admire his beauty. George came across William Gopher and he strolled closer so that it would be easier for William to complement him on his beauty. But William ignored George, and refused to notice George's beautiful fur. Well, that IS strange, thought George, He didn't notice me. So George hopped on, thinking it weird that he went unnoticed on this the most beautiful of days, particularly since he considered himself the most beautiful of all creatures on this earth. Soon, George came upon Martin Crow. I will make my beauty extremely obvious to Martin, thought George, so he hopped right in front of Martin. Hello Martin, said George. Martin ignored him. He flew away without speaking a word to George or complimenting him on his beauty. George was beginning to feel a little bit upset, but he continued on. He thought it strange that he was being ignored by two friends who at the very least should have acknowledged him as being the most beautiful creature on earth. George noticed Nancy hopping through the lane and he called out, "Hi Nancy!" But she continued hopping down the path, totally ignoring his beauty. George didn't understand. I am beautiful today, aren't I? thought a worried George. George, who by now felt very disappointed on this the most beautiful of days, hopped on down to the playground, where he saw that William Gopher, Martin Crow and Nancy TreeFrog were all playing together. George had a sad look on his face as he hopped over to his friends. Why are you all ignoring me? he asked them. You may be comprised of the most beautiful colors of the rainbow, crowed Martin, but lately you are not nice inside. It doesn't matter if we're not as beautiful as you, because each of us is beautiful in our own way. But you George, have been acting like one rude and conceited little rabbit. Beauty is, as beauty does, George, said Nancy TreeFrog. If you treat others badly, and act as if you're better than everybody else, pretty soon nobody's going to think you are beautiful at all!. But if you were the plainest little rabbit on the face of the earth, it still wouldn't matter to any of us, said Martin. We care about what's on the inside, not what's on the outside!. Sharing kind words and thoughtful actions and respecting our feelings is what's truly beautiful, explained William. George realized how badly he had hurt his friends feelings. I'm so very sorry, he told them. I'll do my best to never be rude or act conceited again, he promised. Then George cocked his head and took a good long look at his friends. Have I mentioned how beautiful each of you looks to me today? he asked. Martin, William and Nancy smiled. Awww, c'mon George, they said, Let's all go play. On this, the most beautiful of days! About the Author: Brian J. Stover is a strategic planner for a software company located in Franklin, Tennessee. Brian and his wife Erin already had two children of their own when they decided to open their hearts and their home to more. They have been fostering to children for the Madison Children's Home in Madison Tennessee for about a year now. In addition to their own two youngsters, they are now foster parents to 7 more children. Brian says they constantly learn from experiences with their many children, and began to create stories to fit the situations and discoveries they and their children encountered. This story is one such tale. Write to Brian Stover and tell him how much you've enjoyed reading George The Rainbow Rabbit, at Bedtime-Story. hit the top of the music charts in 1970.